What might seem like common place among vehicle owners today, roadside assistance services, was in fact unheard of nearly three decades ago. This 21st century assistance service where an engineer from a breakdown company comes over and checks the car only to fix the issue or transport it to the nearest garage actually started much later towards the 70s. Prior to that time, most automobile associations had such an arrangement with their members and that too was restricted to a small region or area. One of the first companies or rather associations to start off in 1905 and branch into insurance, driving lessons and breakdown cover was the Automobile Association or AA. This became demutualized in 1999 and the AA Motoring Trust was set up in 2002 to continue its operations under public interest. Today, the unit is part of the Saga Group forming Acromas Holdings. In the early days of such associations, all that members received was a tiny van fitted with a winch and tow equipment to bring a broken down car back. Even the roadside attendant had very little knowledge about cars. Everything changed after the 70s when private players and car insurance companies entered the race. Today, Europe is connected via large automotive assistance services that provide support over country borders anytime of the day or night. Most of the technological advancements seen today in the automobile recovery service have been around for less than 40 years. What you see today is the cumulative effect of nearly 40 years of improvement and development. Back in the days, one would only see small cars and vans or even motorcycles plying the highways to the aid of stranded motorists. They could only manage small or inconsequential repairs. Today’s modern assistance vehicles are fitted with the latest gadgets and tools such as electrics, pro power, hydraulic machinery and other stuff to make recovery work all that easier. In fact, in the UK, each year a show called the Tow Show brings together manufacturers and retailers from all over Europe and America to showcase their latest gadgets and tools in the line of automobile assistance. New technological advancements make the show a hot spot for companies dealing in roadside assistance each year. Even though cars of today are getting sophisticated, they are still prone to occasional breakdowns and having such associations or organizations looking after drivers does offer peace and satisfaction. Some of the early services to provide roadside assistance other than the British AA were Germany’s Allgemeiner Deutscher Automobile Club, the Automobile Association of Canada and Americas. Initially they were founded on a membership only basis but later on these organizations created a fleet of assistance vehicles and mechanics for any person taking a cover from them. 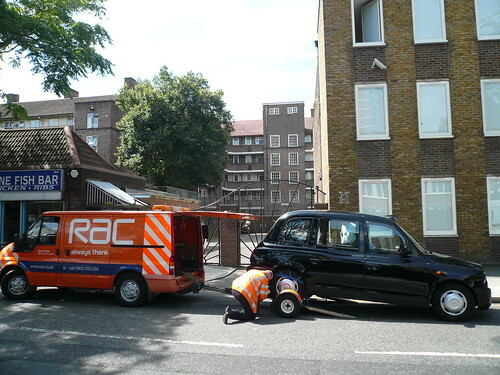 One unique aspect of the early assistance service was the ability to contact roadside assistance. Since mobile or cell phone technology was largely unavailable back then, highways used to have landline connections every few meters so that stranded drivers could call for assistance. Many highways in Europe and the US have operating land line services till now. Simon Jackson works for one of the leading providers of roadside assistance (interesting to know is that the Danish term is vejservice) in Denmark – Falck.